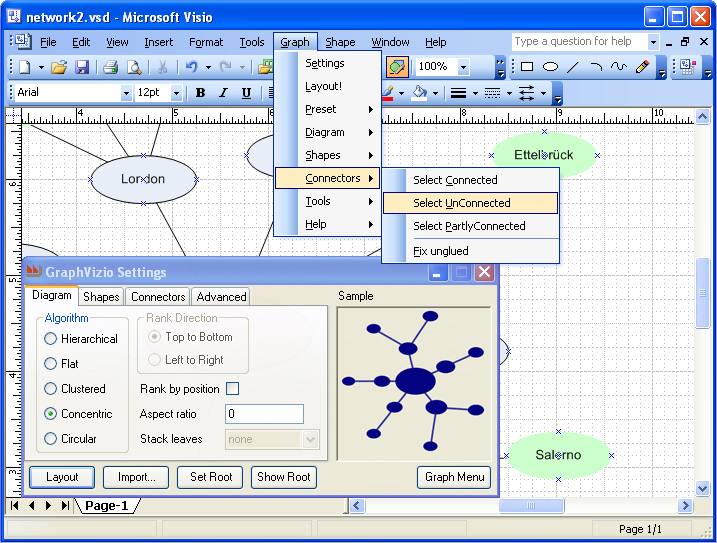 GraphVizio is an addin for Microsoft Visio which allows you to layout Visio diagrams using the renowned Graphviz algorithms developed by AT&T research laboratories. These algorithms provide support for hierarchical, relational, clustered, circular and concentric styles. GraphVizio allows complete customisable control of the shapes, connectors and connection points, all from the standard Visio interface. An animated, WYSIWYG show-me function steps you through real-life examples, allowing you to get up to speed quickly. Size shapes to fit text/to widest/to narrowest/etc.